Georgetown University is a highly selective private research university with an acceptance rate of 14.5%. Located in Washington D.C., Georgetown is the nation's oldest Catholic and Jesuit university. Considering applying to this highly selective school? Here are the admissions statistics you should know. Campus Features: Situated above the Potomac River, Georgetown's compact 104-acre campus gives students easy access to the nation's capital. The campus is home to numerous attractive stone and brick buildings. Athletics: The Georgetown Hoyas compete in the NCAA Division I Big East Conference for most sports. 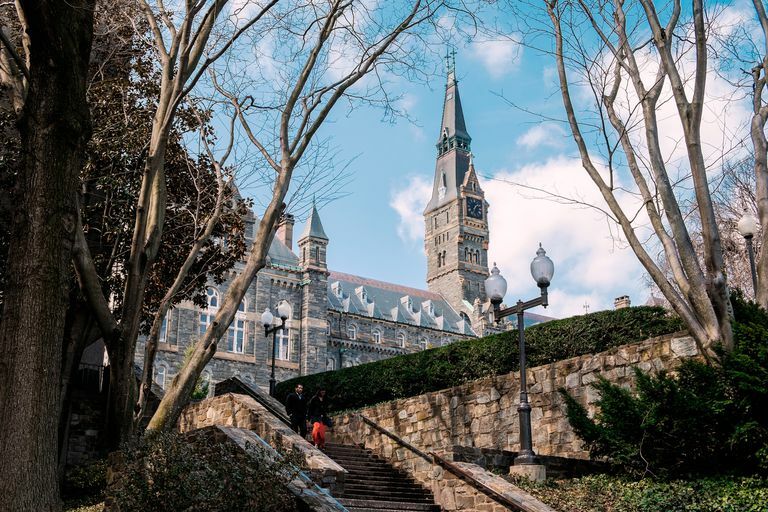 Highlights: Georgetown's location has led to a sizable international student population as well as the popularity of the International Relations major. The school is in close proximity to many other D.C. area colleges and universities. During the 2017-18 admissions cycle, Georgetown University had an acceptance rate of 14.5%. For every 100 students who applied, 14 students were admitted, making Georgetown's admissions process highly competitive. Georgetown requires that all applicants submit either SAT or ACT scores. During the 2017-18 admissions cycle, 68% of admitted students submitted SAT scores. This admissions data tells us that most of Georgetown's admitted students fall within the top 7% nationally on the SAT. For the evidence-based reading and writing section, 50% of students admitted to Georgetown scored between 700 and 760, while 25% scored below 700 and 25% scored above 760. On the math section, 50% of admitted students scored between 710 and 790, while 25% scored below 710 and 25% scored above 790. Applicants with a composite SAT score of 1550 or higher will have particularly competitive chances at Georgetown. Georgetown does not require the SAT writing section. Note that Georgetown requires applicants to submit all SAT test scores. Georgetown does not participate in scorechoice; it considers the highest SAT score from a single test date. Applicants are also required to submit scores for 3 Subject tests for admission to Georgetown. Georgetown requires all applicants to submit either SAT or ACT scores. During the 2017-18 admissions cycle, 55% of admitted students submitted ACT scores. This admissions data tell us that most of Georgetown's admitted students fall within the top 3% nationally on the ACT. The middle 50% of students admitted to Georgetown received a composite ACT score between 32 and 35, while 25% scored above 35 and 25% scored below 32. Georgetown does not require the ACT writing section. Note that Georgetown requires applicants to submit all ACT test scores. Georgetown does not participate in scorechoice; it considers the highest ACT score from a single test date. Regardless of whether you submit the ACT or SAT, you are still required to submit scores for 3 Subject tests to Georgetown. Georgetown does not provide data about admitted students' high school GPAs. Georgetown Applicants' Self-Reported GPA/SAT/ACT Graph. Data courtesy of Cappex. The admissions data in the graph is self-reported by applicants to Georgetown. GPAs are unweighted. Find out how you compare to accepted students, see the real time graph, and calculate your chances of getting in with a free Cappex account. Georgetown University has a highly competitive admissions pool with a low acceptance rate and high average SAT/ACT scores. However, Georgetown, like most of the country's top universities, has a holistic admissions process involving other factors beyond your grades and test scores. A strong application essay and glowing letters of recommendation can strengthen your application, as can participation in meaningful extracurricular activities, work experience, and a rigorous high school curriculum. The application requires three short essays: one about a school or summer activity, one about you, and one focused on the school or college at Georgetown to which you are applying. Note that Georgetown is one of the few top universities that uses it's own application and does not use the Common Application. Georgetown University also requires all first-year applicants to complete an interview with a local alumnus unless it is geographically impossible. Most interviews take place near the applicant's home. Although rarely the most important part of the application, the interview helps the university get to know you better, providing a chance for you to highlight interests that may not be evident on your application, as well as giving you an opportunity to learn more about Georgetown. 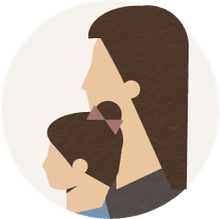 All admissions data has been sourced from the National Center for Education Statistics and Georgetown University Undergraduate Admissions Office. How Competitive Is University of Minnesota's Admissions Process? How Competitive Is James Madison University's Admissions Process?